Businesses and home users are increasingly moving to hosted VoIP services in a bid to seek a more affordable, modern communication solution for their workplaces. Choosing the right VoIP phone for your office or home can still be a bit intimidating if you're not sure what to consider. We've put together a few tips to get you started and give you some support when making this decision no matter the size of your business or needs in the home. Single line or multi-line VoIP phones? When making a choice on a VoIP phone, it's important to consider what it will be used for and who will be using it. If your office is a particularly busy one with lots of incoming and outgoing phone calls you may consider buying a multi-line VoIP phone. Similarly, you may consider a multi-line VoIP phone for your receptionist as they will be dealing with a lot of calls on a daily basis. Having more than one line allows for putting calls on hold, taking new calls, initiating conference calls and generally handling multiple calls at once. Single line phones can be useful just for internal calling, however the lack of lines could be restrictive. Three line VoIP phones will generally be suitable for the majority of needs, although you don't need to purchase the same type of phone for all staff, so you may consider a VoIP phone with more lines for larger enterprises or employees who deal with higher call volumes. 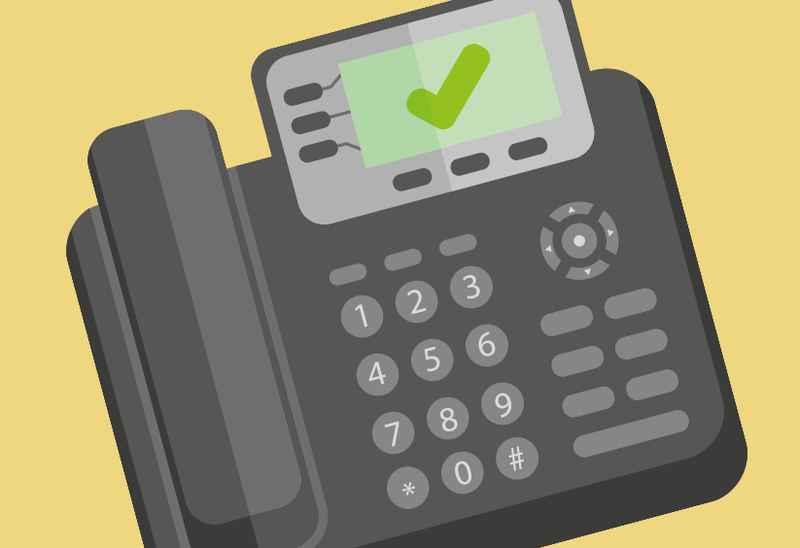 PoE or mains powered VoIP phones? PoE or Power over Ethernet works by sending power to a device via the connecting Ethernet cable. If a VoIP phone has integrated PoE and is powered by Ethernet, this ensures that you will not need an additional power supply for your phone. You will be able to just plug it into a PoE switch or Internet connection and go! POE power comes from a central source and offers uninterrupted power and this also saves you additional outlay on power units as well as reducing the clutter of wires on desks. Multiple PoE phones when coupled with a PoE switch can operate on a single Ethernet connection which also eliminates the need for additional power outlet installation. Do remember that a VoIP phone must be PoE enabled to be able to use this technology and older phones may not always be compatible with PoE. Your VoIP provider may provide features such BLF (Busy Lamp Field) capability, phone books and call transfers. Some VoIP phones may not have the capabilities to support these features, so it is often worthwhile considering what features are offered by your VoIP provider and which ones you will use. Some of the key functions to look for include programmable keys, short code support, call transfers, conferencing and multi-line support, but do consider which features you and your team will need day to day and make a decision on your phones based on this. Whether you pick a wired or wireless/DECT phone will depend on your situation and employees. Wireless DECT phones are excellent if you want freedom from your desk and for roaming from room to room. As a result these phones are preferred for use in home offices and warehouses. Wired or corded desk phones are popular in offices around the world, and while there is an growing use of BYOD (Bring Your Own Device) in workplaces, with many office workers primarily based at their desks, this type of phone is still a firm favourite as a robust and reliable solution. Again, do pick the phone for the needs of your employees, whether that's a range of desk phones or a mix of corded and cordless VoIP phones. Who will be using these VoIP phones? Amidst all these points, one of the main factors that we keep coming back to is 'who will be using the VoIP phone?'. If the phones are going to get a lot of use or if the employee is going to be on the phone all day, pick a higher quality phone with a good build quality to last the course. Likewise, if they will be dealing with a high volume of calls, buy a multi-line phone, and if they will be at their desk for the majority of the day, choose a desk phone. Of course one of the other considerations when purchasing phones for your office is to make sure that they are VoIP compatible and will work with your designated VoIP service. VoIP phones can look very similar to analogue phones, however there are a few key differences, most notably a VoIP phone will usually have an RJ-45 ethernet port to connect to an internet connection or router, as well as using SIP protocols. Check out our blog post on VoIP phones for more information on the differences. There are a number of leading VoIP phone brands from Grandstream and Snom, to Polycom, Yealink and Gigaset. Each of these brands offer a range of different phones with different qualities. If you need to compare different phones, do have a look at the range on our VoIP phone store. You'll find a wide array of phones whatever your business needs and size.